When water flows backwards through the water supply system, it is called backsiphonage or backflow. When that water is accidentally mixed with hazardous chemicals or bacteria, it can be dangerous…even fatal! Another potential danger to the water system comes from a surprising source. Did you know that a common garden hose could contaminate the water supply if it is connected to a harmful substance and the pressure in the water main line drops while your hose is submerged in polluted or contaminated water? The water (and whatever is in it) could be sucked back into your pipes and your drinking water supply. Water pressure drops can happen when firefighters battle a nearby blaze or when repairs are made due to a broken water line. This contamination could come from the chemicals used to fertilize and kill weeds on your lawn. The cleansers used in your kitchen and bathroom could be hazardous if swallowed, as could bacteria in the water from your pool or waterbed. 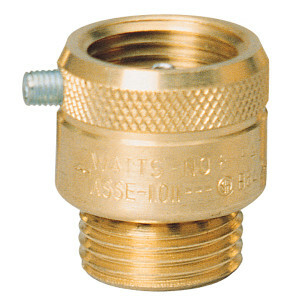 Buy and install inexpensive backflow prevention devices for all threaded faucets around your home. They are usually available at hardware stores and home improvement centers. If you install a pool or sprinkler system, have a representative from your water district inspect the device for proper installation, whether this is required or not. Never submerge hoses in buckets, pools, tubs or sinks. Always keep the end of the hose clear of possible contaminants. Do not use spray attachments without a backflow prevention device. The chemicals used on your lawn are toxic and can be fatal if ingested.